what are the "default" best settings for the tinybox for medium-to-loud rock shows? About the "left" switch (gain? ), which setting would you recommend? I recommend low gain. I had a few shows brickwall at med gain into an Sony M10. This depends on how much your mid gain really is. 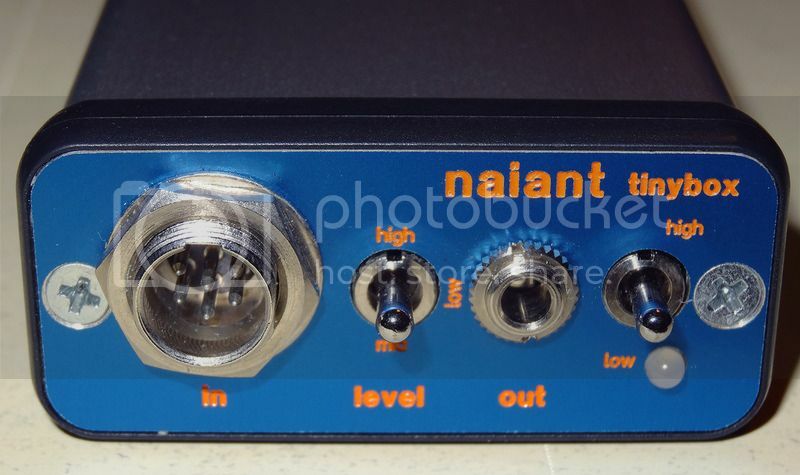 Since tinyboxes were built to spec, the buyer could freely choose their gain settings. So your mid gain might be different from mine. I also got a similar setup a few weeks ago (except that I have the Sony M10 as a recorder) and ran it at three shows since then. For medium to loud rock shows, I'd use the low gain setting on the pre and line input on the recorder. If you can't get good levels that way, switch to the recorder's mic input. One of the three shows I taped was Tindersticks (really silent, minimalistic sound). I ended up with the tinybox at mid gain into the M10's mic input. So I guess, it really depends on the situation. But as a rule of thumb: Loud shows = low gain, quiet shows = mid or high gain. Edit: My tinybox has a polarization voltage of 48V, so that should decrease sensitivity by about 2dB compared to the 60V Schoeps spec (if my math is right). But that small difference should be negligible. The gain on mine is 4/18/32, which I think is standard. I thought for sure 18 (mid) would be perfect, but I was burned twice. If you can't get good levels that way, switch to the recorder's mic input. I would not do this. Start with Tinybox at low gain setting and always run Line In to the recorder. Adjust the gain on the recorder to get the levels where you want them (-6db for me). If you find that you need to have the gain on the recorder cranked up high move the Tinybox to the mid gain setting and lower the gain on the recorder. Rinse. Repeat. Until you get the levels dialed in. I would not do this. Start with Tinybox at low gain setting and always run Line In to the recorder. What's the rationale behind this? OP said he's recording rock shows which I took to mean loud and amplified. I believe the Tinybox will provides ample gain on its own. My goal is to use the least amount of gain from a handheld recorder as possible and get my gain from the pre. I dont own a DR2d - so maybe I'm wrong but I dont need to run mic in on any recorder if I have a stand alone pre in front. thanks for the infos..will probably test the new rig on April 2. Finally got the caps today! My gain is 10, 20, 32 and I use 10 for FOB and 20 for OTS!! I've never had an issue. way I can not detect while recording and can only discover later when listening back to the recording? on the recorder were ok but in the end the file had clicks and overloading issues in it. instead of Line-IN or as long as the tinybox led is green and shows no clipping I am safe? and when should it be useful? Fwiw i typically run my tb at mid gain (+18db) for most shows unless im onstage or waaay close to the stacks. My m10 is usually at level 4 setting going LINE in always.this is running gefell m21>nbobs>tinybox>m10. Basically the same settings that I use with mk 4s or 41s, KCY cable, tiny box and an M10. Perfectly good for most shows from near the SB. Page created in 0.197 seconds with 43 queries.